A bivy sack, otherwise known by its full name, a bivouac sack, is a personal-sized waterproof shelter. Originally used by climbers on multi-day excursions, it is a very small and lightweight alternative to carrying a tent. Now it is used by hikers, mountaineers, minimalist campers and the like. The basic purpose of a bivy sack is to add a thin waterproof fabric over you in your sleeping bag to protect you while you sleep. It provides insulation and prevents wind chill and rain. The most basic bivy sacks have an opening for your eyes and for breathing. Though, recently, with the introduction of waterproof and breathable fabrics such as Gore-Tex, bivy sacks are able to close without any opening, completely shutting out all the elements. There are many types of bivy sacks to choose from. Some are more closely related to tents with a structure, and some have different types of fabrics or openings. Depending on what type of camping, hiking, or climbing you do, there is a bivy sack for everyone. Fabrics. 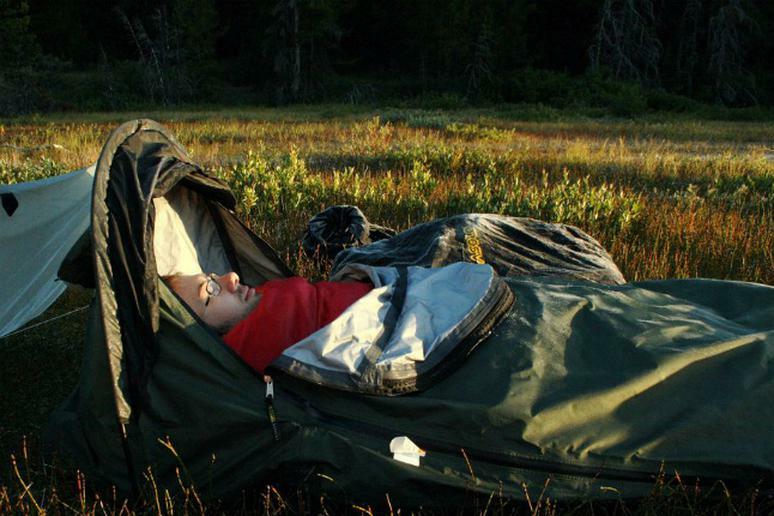 Most bivy sacks have two different types of fabrics. The floor fabric is heavier and more durable for ground conditions. The other fabric is a lighter, more breathable fabric that is still waterproof and durable, but lightens the load. Structured vs. Non-structured. Structured bivy sacks are great if you like a little bit extra wiggle room. They give you extra head space and breathing room. Non-structured are perfect for when you reach extreme elevations, and you really need to cuddle up to hide against the elements. Openings. If you feel uncomfortable with a completely enclosed model, there are models with openings. Some offer openings with mesh covering so that you don’t have to worry about swallowing bugs as you sleep. Size/weight. While fabric has a lot to do with the weight of your bivy sack, there are plenty of options to choose from in size. Because the bivy sack was created for the minimalist, you do have many ultralight options. Check out the assortment of bivy sacks on Amazon.